Huge violet-purple blooms which open early and last longer than many other varieties. Also called peony tulips named because of the double flowers that you see on peonies. Also called a 'Peony Tulip' because of the striking resemblence to the double flowers of a peony, 'Blue Diamond' has huge violet-purple blooms which open early and last longer than many other varieties. Tulips are one of the most popular bulbs as they are perfect for planting in a mix of different colours to create vibrant spring displays in your garden, patio or decking and they also make great cut flowers to brighten up the house. 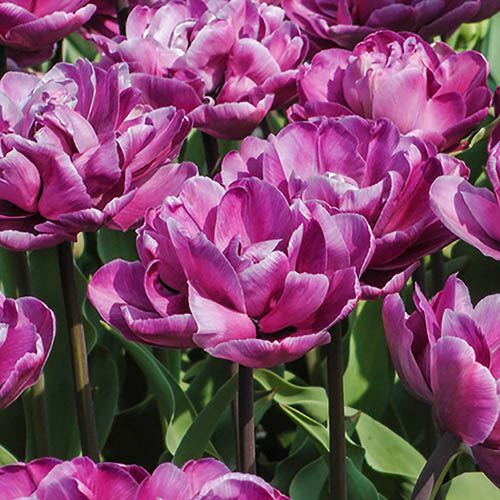 These blousy tulips are particularly special as a cut flower as they are quite different and unique - why not give a bunch as a gift to a friend or family member on a special day? Although easy to grow and care for, double tulips, with their heavy flowers, are slightly more vulnerable to wind so choose a sheltered spot away from any harsh weather conditions and plant in autumn for stunning spring displays. Supplied as a pack of 12 bulbs, ready for planting. Size 11/12.